“Are you getting excited?” a friend from home asked me one evening. Oh, you know. Finally being able to listen guilt-free to the Christmas music you’ve been playing since October. Waiting for that first blanket of snow to cover the ground like a carpet of powdered sugar. The lights, the ornaments, the mistletoe and wreaths and trees. All of it. Christmas. Truthfully, after society forced me to smother my festive flame in early November, I’ve been having trouble getting it going again. And I’m not totally sure why. Christmas as an expat is something I’ve always dreamed of – ever since my dad told me once of spending Christmas in an isolated German village when he was in the military (I’m actually not even sure if he actually ever told me that story or if I just imagined it as a little girl…). But the idea of being far away in an ancient snowy village during the Yuletide festivities seems so romantic. And I’m nothing if not a romantic. The problem is, the picture in my head of an adventurous soldier walking down a winding street between tall, narrow houses with slanted roofs and brick chimneys, through a snowfall on Christmas Eve with the sounds of laughter and singing coming from lit windows of a nearby pub… It is just so not like my frantic scramble to find affordable Christmas lights that reach longer than one meter while dropping school supplies and papers to grade in muddy puddles that lurk about the streets waiting to grab unsuspecting foreigners by their heels. I could hear the chains rattling on the second floor the moment I stepped into the stairwell. The bell had just signaled a break and scuffling of feet and creaking doors drowned out the somewhat ominous clank-chink-clank. December 5 is Svátek Svatého Mikuláše – St. Nicholas Day. Typically, gifts are given and the Christmas atmosphere kicks into high gear. But that’s certainly not the only thing about this peculiar Czech holiday. 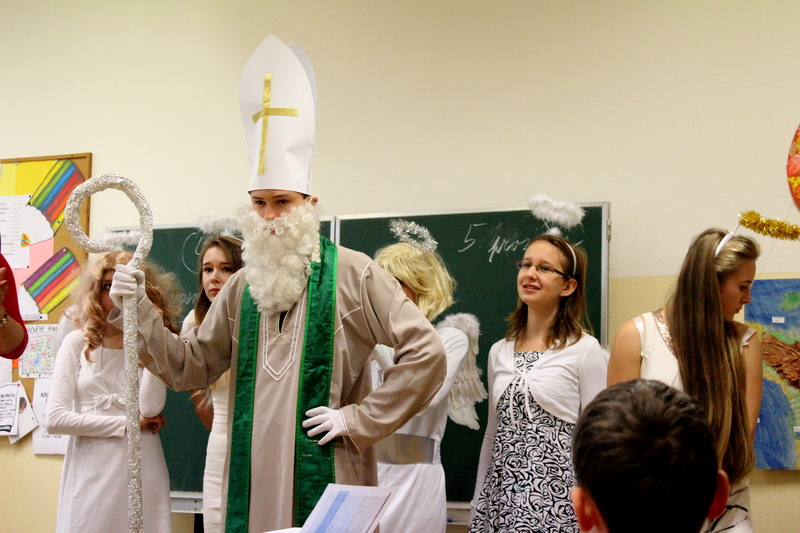 You see, the tradition of Svatý Mikuláš includes three important figures – St. Nicholas himself, who appears not as a jolly old man, but as a bishop in flowing white robes; angels, sweetly designated to hand out candy; and the devil, the most prominent figure, if for no other reason than that people love a bad guy. 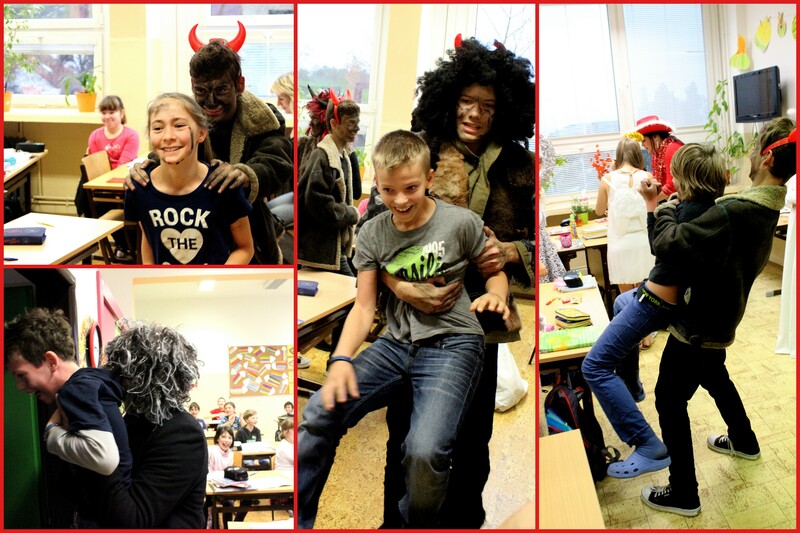 In schools, and in smaller villages and neighborhoods, I’m told, people will dress up as these characters and … well, I was about to find out just what exactly goes down on December 5th in the Czech Republic. An hour before my first lesson, I trooped into school with a camera and a lot of expectation. I missed this event last year but it’s pretty widely talked about. 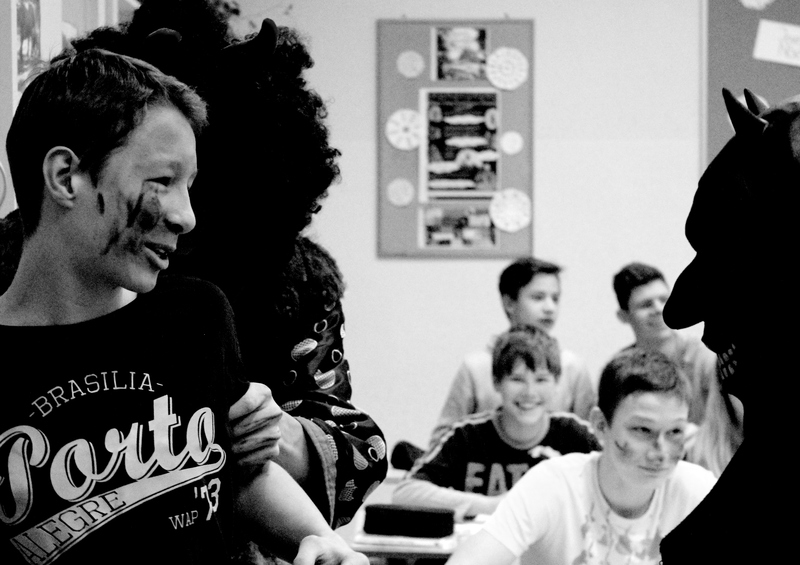 In 9.B, boys and girls were busy fixing their costumes and make-up. Each of the ninth grade classes had one Mikuláš and the rest of the unruly students were divided between the ranks of devils and angels. Our Mikuláš in 9.B was a sweet, albeit extremely wry, boy of average height and above-average prankishness. The angels were all girls (except for one, very small boy who donned a wig and satin nightgown just for the occasion) dressed in pretty white gowns, halos and fake wings. But the devils are what really stole the show. Czech devils aren’t like American devils. There is no sheik suit, no slick horns, no sharp chins or forked tongues. Czech devils, which appear routinely in the popular (though cheesy) fairytales shown on television, are furry and fiendish. They have masses of black hair, vests of animal skins and fur-covered boots. Soot-painted faces gleam as the chains around their waists and shoulders rattle. 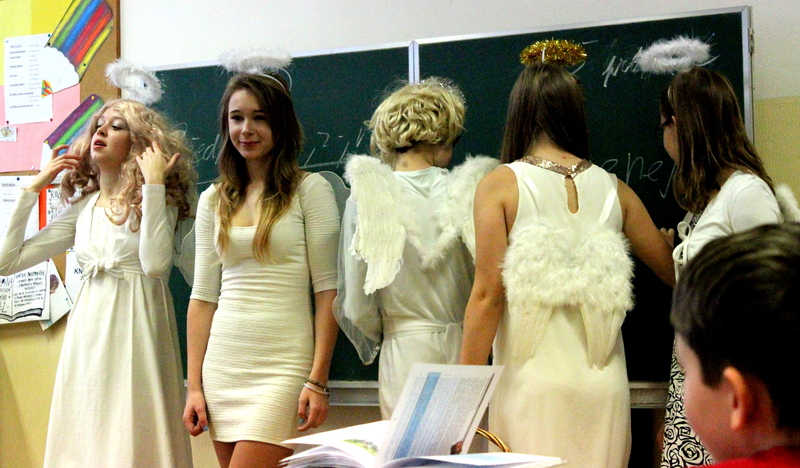 My students – though exceptionally cute on a normal day – looked every bit the part a Czech devil. For the girls and the smaller boys, this was an entertaining transformation. For the few gents who’ve already topped six feet, it was an intimidating one. “Oh, sorry,” said a boy with a shaggy wig as he bumped past me. I caught a glimpse of his face and smiled. “I skipped class for the morning,” he told me with a sheepish grin. Radek was a favorite in 9.B and he sometimes comes back when the school has a special program like today to visit his old friends. He walked away and I heard my name. 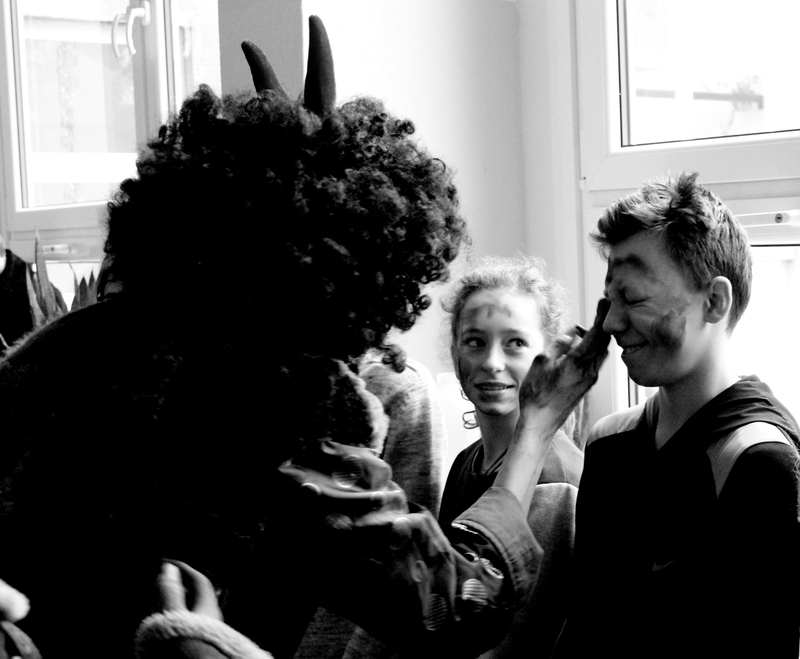 Three devil-decked students ran up to me with charcoal in their hands and began smearing my face. “Having fun, are we?” I asked, not daring to move but not entirely sure what else to do. They giggled maliciously as someone gave me a mustache. The bell rang again, issuing children into their classrooms, but 9.B waited in the hallway. Time to work! In a few minutes, their class teacher bustled over and hurried everyone upstairs to 4.E, a ferocious collection of ten year olds. The door was shut. The hall was silent. Then, the devils began pounding against the doorframe, yelling at rattling their chains. It was enough to scare me. I can’t imagine what it must be like to be a fourth grader in this country. The door swung open and in trooped the posse of celestial beings, led by the dear old saint brandishing his tinfoil staff. 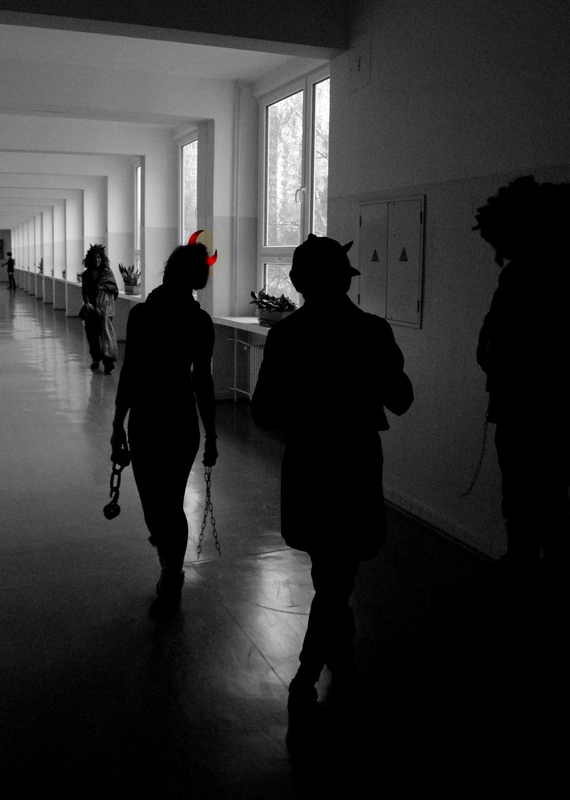 The angels stood aside and the devils ran through the classroom, smearing kids’ faces with chalk and chortling gleefully. Now and then, someone would grab a kid and drag them from the room. 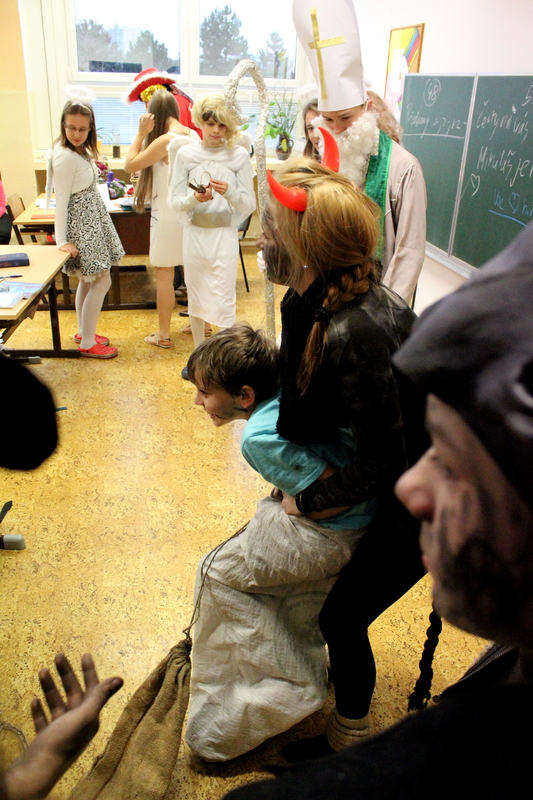 Old Saint Mikuláš just leaned patiently on his cane with a disapproving look at the students. When the last fourth grader had been wrestled out of the room, kicking, yelling and (usually) laughing, Mikuláš glared down the remaining children. With some encouragement from the two teachers in the room, the kids bumbled their way through a song and the angels glided their way between the desks passing out candy. I slipped into the hallway. Here was a different scene entirely. None of the corridor lights were on and even the large windows did little to illuminate the setting as grey sunlight seeped through thick panes of glass. In the relative darkness, I could see what can only be described as a divine struggle. 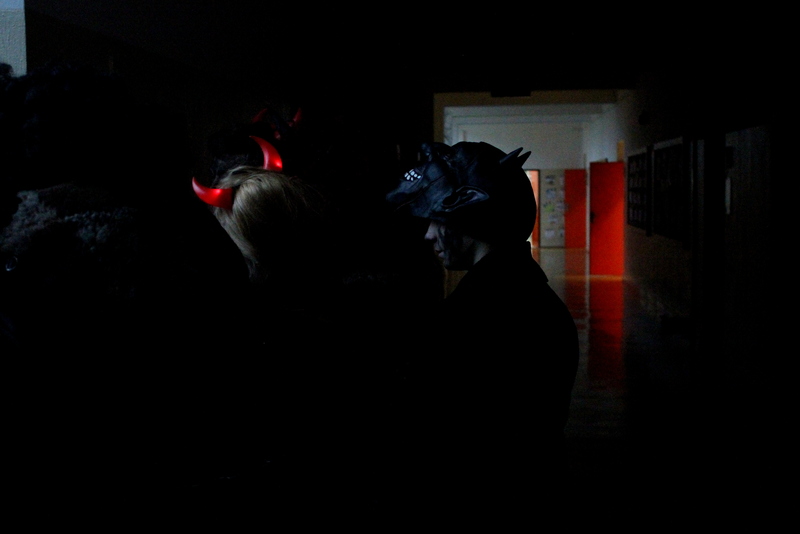 It appeared as though several of the fourth grade boys had escaped and the devils seemed to be chasing them down. Most of the trapped souls were huddled between the darkly masked ninth graders, a few still attempting to break free. Sometimes they would be offered a potato, sometimes they’d be painted in more charcoal, and sometimes (if they put up enough of a struggle) they’d be shoved back into the classroom – kicked out of hell for bad behavior. The six graders were next and things played out similarly. The raid, the singing, the candy, and the havoc in the hallway. The only difference was that the sixth graders were much less inclined to sing for the company of fidgeting angels, all tugging at their skirts and halos or hijacking the classroom chalk to scribble on the board behind them. Frankly, it looked like the devils were having a lot more fun. The eighth graders were even more difficult to coax into song, and certainly too big to carry out of the classroom. Several of the more willing victims were led away, the rest sat looking as though they weren’t sure if imprisonment in the hallway wasn’t better than singing in the classroom. There were no fugitives on the run this time as most of the eighth and ninth graders are friends. They allowed themselves to be painted in black and lumped reluctantly back to the classroom to resume lessons when the angels finished their routine. The seventh graders downstairs were much like their sixth-grade counterparts, only harder to get out of the room. A larger boy refused to leave his seat, so the cheeky ninth grader grabbed his chair and dragged both ‘the horse and his boy’ from the class amid roaring laughter. A few moments later, another boy was shoved back into the classroom with a potato sack over his whole body. He found his chair and sat down without ever taking the bag of shame off. By far, the fifth graders were the most entertaining. This is largely because 5.B houses some of the most rascally boys I have ever encountered in my life. It only took a few moments for my ninth graders to realize they might have been wearing the costumes, but they weren’t the real devils in this situation. 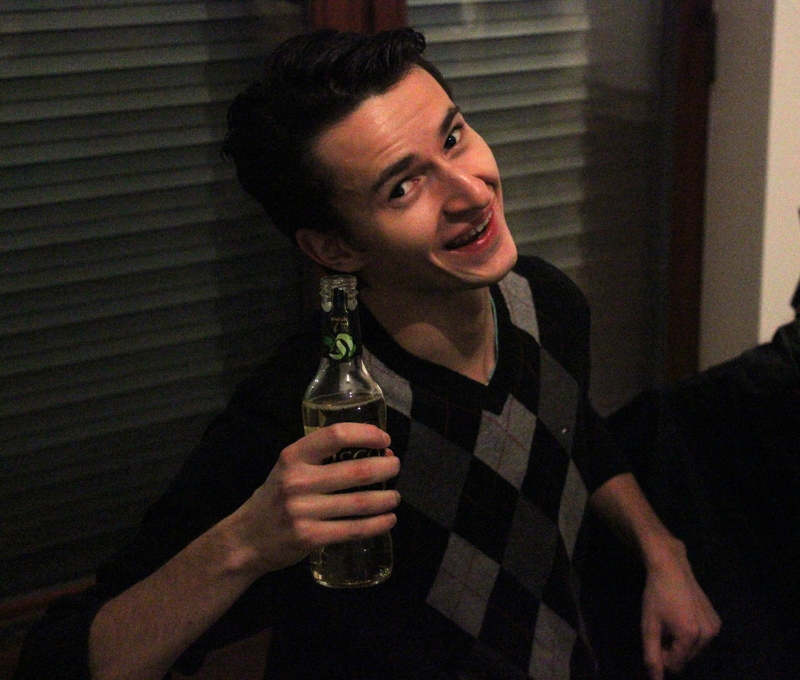 Captain of Chaos and Scallywag-Sweetheart Extraordinaire is the one and only, Lukáš. He’s got eyes the size of planets and a smile that spells trouble. He can squirm his way through the eye of a needle and he’s faster and more agile than any boy I’ve ever met. I spent the better part of last year trying to figure out how to get him to sit in a chair for more than three minutes at a time. I was largely unsuccessful. He climbed into cabinets, stole my keys and held them for ransom (that was a lesson: don’t ever bargain with the terrorists), and hid under my desk for nearly fifteen minutes before I realized where he was. The last one was a special feat for him just because he had to stay so still to go undetected. The devil in charge – an equally headstrong girl who had positioned herself as the unofficial ringleader of the devils’ squad – had taken Lukáš from the room and was attempting to subdue him. I could have told her, he would not be subdued. When I slinked out of the classroom and the forcefully cheery sounds of singing, Lukáš was grunting, elbowing and kicking like a spring colt. He bolted loose and took off down the hall, passing Radek who was dragging another runaway back fromt the stairwell. It took the whole squad of ninth grade devils to stuff Lukáš into a bag, everyone holding a limb or a part of his writhing torso. Even as his subduers tried to drag him back into the classroom, Lukáš squirmed and fought, finally breaking out of the bag in front of all his school mates. Most of the devils collected in the doorway to watch the events that followed but I crept back into the hallway where Radek was waiting by a windowsill. It didn’t occur to me that something might be the cause of his isolation – he was always a quieter student. “What do you think of everything?” he asked. He looked at me as if that answer weren’t enough for his question. He nodded his head. I’m not sure if he was processing what I just said or just trying to understand all the English. He speaks well, but second languages are difficult, always. Having completed the ritual in the last class, 9.B and their teacher asked me to take their picture on the stairs. Then we all marched down to the principal’s office to sing for her and the vice-head with the other ninth graders, 9.C. I let them do their thing and quietly slipped back up the stairs to my office. Sitting the hallway outside my door was Radek. He was leaning crosslegged against the wall the same way I had seen him every Wednesday afternoon last year before our afternoon English lesson. But this time he obviously wasn’t waiting for anything. “Whatcha doing?” I asked, sitting criss-cross-applesauce in front of him. “Oh, just sitting,” he said in rather a Pooh Bear voice. “Do you like your new school?” I asked. “Yes,” he said. There was some hesitation. “Are you making new friends?” I asked. More hesitation. “So what’s going on?” I asked. It’s one of those questions you already know the answer to but you know they need to tell you anyway. “I’m not sure if I can say it in English,” he said. Emotions are complex, even in your first language. He looked at me curiously – as if the idea of adults having feelings was totally foreign to him. “Well, I have to go back to America in the summer and I don’t know if I’ll ever be coming back,” I said. “It’s hard to leave a place you love and feel like you belong.” He nodded again. This time I knew he understood what I was saying. I went back to my office and he, I assume, rejoined his friends when they finally made it back to their own classroom. Sometimes we find ourselves in dark hallways sharing our hearts with unexpected people. I think that’s partly because we always underestimate how much humans have in common with each other until we stop and listen, and partly because dark corners are more common than most of us assume. Sometimes we find ourselves in the clutches of devils that make us wrestle and fight to get back to the safety of the classroom and no one will bat an eyelash because, what’s not normal about that? No, what’s not normal about struggle? What’s not normal about that on-going battle between our sin natures and the renewing of our hearts through the Lord? We fight impatience and doubt, discontentment and distrust. We wrestle and squirm and struggle. Welcome to the life of the Christian soldier. I think it’s important to remember a few things. 1. Moving on or away may be hard, but God’s plan is always, always better and more beautiful than ours. And when we cling to what is slipping away, we find ourselves both without what we had and without what God is giving to us – we’re just alone in a dark hallway, refusing to move on. 2. The struggle with our flesh will not end until we draw our last breath. When we’re tired and ready to give up, we need to turn to the Lord and his Word to renew our strength and continue the battle. Always, always fight your way back to the classroom. I have never cooked a turkey before. That’s really the only place to start this story. It’s either there or on a bus headed across town balancing a box full of pumpkin pies and a bag of onions and ground beef. 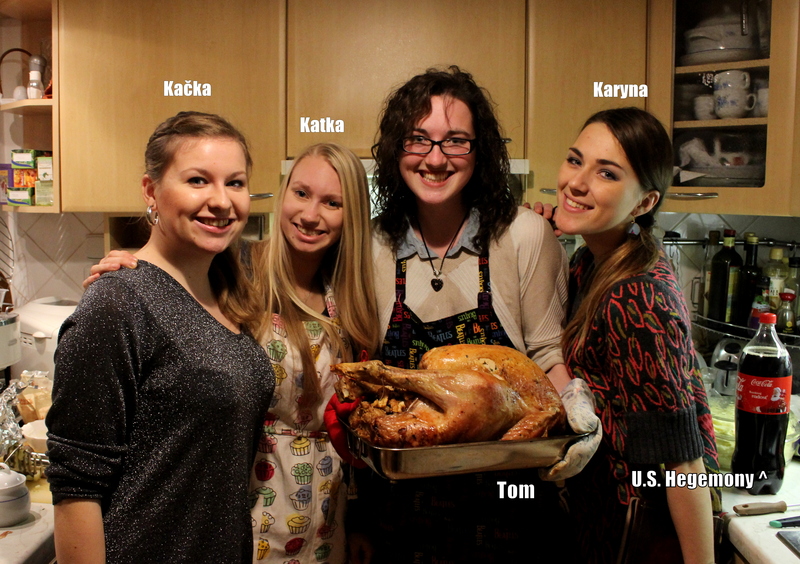 Last week I helped organize and cook for an ‘expat Thanksgiving’ with my Czech friend, Katka. It was a last-minute affair. About the only details nailed down were that I was bringing pumpkin pie and that our bird would need at least 3 and a half hours to finish cooking. We planned to serve dinner at 8:00 so that meant I had to be in Katka’s kitchen at 4:00 or we wouldn’t have a cooked bird when everyone showed up. I trekked out to school Wednesday morning with an overnight bag packed, a cloth grocery bag with 24 rohlíky (bread rolls) for the stuffing, and a cardboard box containing twelve plates and two precariously balanced pies. I skipped lunch break at school to run to the local Billa to pick up more ingredients for the stuffing. Hungry – and further saddled with nuts, raisins, celery, onions, a weird vegetable that smelled like it would taste good in stuffing, and several packages of ground beef – I made my way through chilly streets towards the bus stop. By the time I got on the metro, I was beginning to realize that the pies were not going to make it. No matter how carefully I held them, I could feel them shifting and sliding in the box. Katka texted me a bird update. (I was getting worried she might not find one because turkeys aren’t very common here). Our instructions went back and forth – mine on how to prep the turkey, hers on how to get to her house from the metro (another long bus ride in which the pies decided to sit on top of each other). Katka picked me up at the bus stop outside of a Lidel, carrots and potatoes in hand. We stomped through the cold and the dark to her house, shifting our groceries and sharing our experiences with dinner so far – hers being de-necking the turkey and mine involving an unfortunate mix-up in the store over the celery. The language barrier continues to stalk me (no pun intended). We dropped our ingredients on the floor of the kitchen and I turned to find myself face-to-face with a magnificent, massive, extremely dead turkey. I peered down the neck of the turkey. It looked pretty vacant. “So, they probably killed this guy this morning,” I said. “Yesterday at the earliest,” said Katka, shuffling around for a pan to cook our bird in. “Poor Tom,” I said, giving the bird a pat. “All turkeys are called Tom,” I replied. Katka held up two pans, one with a wider breadth and one with a taller rim. “Thomasina?” I said, pointing to the taller-rimmed pan. We put the turkey in the pan and I sewed up its neck. I knew that we had to get the bird cooking now or it would never be done in time, so I made the executive decision to put it in the oven while we worked on the stuffing and then bake the stuffing while we took the turkey out for basting and final prep. At first this plan seemed perfect. Tom didn’t go into the oven easily – she was a big gal. But when we finally had counter space to chop onions, shred bread and crush nuts, the stress level decreased dramatically. Out of sight, out of mind, I guess. Janek – Katka’s younger brother, an adorable twelve-year old who is one of my favorite human beings ever – peeled about 35 potatoes for us. Our last cooking project together, we made him grate 8 ounces of cheese, which he did silently and without complaint. It took him almost an hour, but we dubbed him the Cheese Master. “Now I’m Potato Master,” he said in his broken English. We pulled up my email so I could check the recipe Mom sent me – not that we really followed it. About that time, Matouš made his entrance. Katka’s older brother, Mat, was the brawns of our operation. You see, we weren’t actually having dinner at their house. They are in the process of moving to a new home down the street. It is currently empty of furniture but has a lot more room. “Are we going to move the table?” asked Mat, his college bag still slung over his shoulder. “I still think we should just sit on pillows on the floor,” I said. 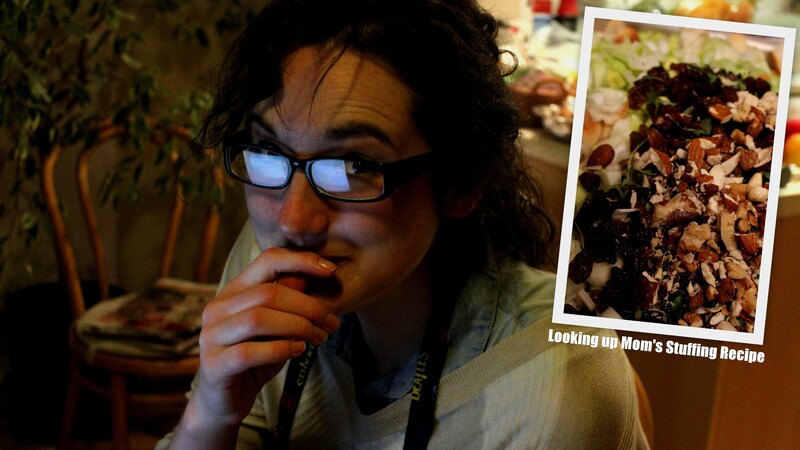 Mat scoffed at me a little – it was that “Ridiculous Americans” look that I’m so used to. Mat shakes his head and smiles. It’s time for our turkey-switch. Our stuffing – which looked a bit like a bread salad with clumps of uncooked hamburger meat on top – waited on the counter. I opened the oven and wrestled with a piping hot, very heavy turkey. Katka slipped in the stuffing and closed the oven door. The turkey looked amazing. It had turned all golden and crispy on the outside. Katka had a butter and rosemary baste ready. She was pretty excited about it. I’m all about that baste, ‘bout that baste, ‘bout that baste. I’m bringing tuuurkey baaaaaaack. Tell all your skinny chiiickens thaaaaat! While we waited for the stuffing to bake and turkey to chill out and for Janek to finish peeling the potatoes, we looked at our recipe for candied yams. Sweet potatoes are also really hard to come by here but I’d heard that you can use carrots instead. “Are you sure this is going to work?” Katka asked. “Yeah, I’m positive,” I said. I had some pretty serious doubts. “This says we need marshmallows,” said Katka. “Can you call Jared and tell him to bring it?” she asked. I sent him a desperate text. He responded with a request for bus times. This is when we ran into turkey problem #2: stuffing a partially baked turkey is just like, really hard. Physically and emotionally, if I can be so bold to say so. The stuffing had some issues of its own, but trying to fit it into the gaping hindquarters of a dead bird that was squirting warm juice everywhere was one of the oddest and most disturbing things I have ever done on a major holiday. Furthermore, sewing the turkey back up again also proved to be a challenge. “This was not meant to work like this,” I said. It was pretty magical, I thought, looking at Tom who was bursting in odd places with stuffing. She was even harder to get back into the oven once stuffed, on account of the fact that now she weighed about as much as a small manatee. Janek had peeled and halved the potatoes and had started washing dishes without being asked. We started boiling the potatoes and dicing carrots. At some point we poured cranberry preserves into a saucepan with ginger, cinnamon and currents. It was a waiting game. Waiting for the turkey to do its thing. Waiting for Jared to show up with the brown sugar. Waiting for the ten or so people to show up and wonder why nothing was ready. Waiting for something to go tragically wrong because of course something would. We played music and danced around with vegetables. I broke a glass which we then had to sweep up. I’m all about that baste, no cheesecloth. I was beginning to worry about our turkey time-line, with so many things waiting on it being finished – nothing could go into the oven until it was done and we couldn’t finish the gravy without drippings from the bird. Also, Jared was still AWOL with the brown sugar. Abort mission. Planet does not support life. Jared and I are both slightly obsessed with Interstellar right now. DO NOT QUIT ON US, JARED JOSEPH. WE NEED THAT BROWN SUGAR. “Sure, I’ll ask him.” Katka hollered upstairs and I checked my phone again. Jared was in line. Good. We washed dishes and finished the mashed potatoes. Between the potatoes and the gravy, I used every drop of butter and milk in the house. The gravy was becoming a problem. No matter how much flour I added to thicken it or milk I added to stretch it out, it seemed to stay the same size. We had about three servings worth. I had to make three servings cover a dozen people. “You disgust me,” I told the gravy as I added salt and pepper. 2 minutes to Saturn. Will await visual. Mat was still doing an inventory of drinks we needed and hadn’t left yet. I texted Jared back. Enroute. Slight delay. Stay positioned for contact. “Perfect,” I said, whisking into the gravy another tablespoon of flour. A few minutes later, Katka’s phone rang and she walked away to answer it while I pouted over my hopeless gravy. Katka was standing in the doorway with a concerned expression. I whipped out my phone and texted Jared. What do you not understand about ‘Stay in position until contact’? Where the heck are you? We took the turkey out one last time to baste and I spooned some of the drippings into the gravy. Between me, Tom and the pathetic grey sludge in the pot, nobody was having a happy Thanksgiving. “Do you have a meat thermometer?” I asked Katka who was slicing the last of the carrots. “Great. How are we supposed to know when the bird is done?” I said. A knock on the door interrupted our exchange and Katka went to answer it while I moaned over our half-cooked turkey. “Guess who’s here?” said Katka with a smile. But I already knew. My spidey-sense had gone off before she even walked into the room. I spun around, potato masher in hand, ready to dish out a steaming hot plate of ‘what were you thinking?’ – Jared. “I hope you got my last transmission,” he said. Jared held out the brown sugar. I sighed and mentally put crazy-cook in check. He trotted off again and we set to work on brown-sugaring our carrots and starting batch #2 of mashed potatoes (because we didn’t make enough the first time. Of course). I almost couldn’t believe how well everything was turning out when the first guests arrived. It was our friend and partner in crime, Kačka, and some of her classmates, a German boy named Nils who pretended not to know English to get out of helping move chairs, a German girl named Ellen who I can only describe as adorable, and Karyna, a Ukrainian beauty with both the wit and ferocity to take on and overcome any threats to the human world the 21st century might throw at us. I feel safer knowing she is on the planet. Introductions were made and there was a general ‘ooo’ing and ‘awww’ing at all the food on the counter. “What’s this?” asked Karyna, pointing at our ‘sweet potatoes’ with a curious smile. “Those are sweet potatoes,” I said. I laughed and explained our attempt to mutanize the dish. There is no arguing with Kačka, ever. I pulled out the turkey and set it on the counter while everyone took out their phones. Turkey selfies are the only way to start out the holidays. The boys showed up and started moving chairs and the large wooden table to the house down the street. (“I don’t know why we’re doing this,” Karyna said. “We should just sit on cushions on the floor.” Mat rolled his eyes and continued moving chairs). Eliška and Vojta showed up just in time to help us carry pies and potatoes across the street, but not before giving me a big, long-overdue hug. The company departed to the other house, laden with goods and furniture. Káťa (the third Kateřina in our ‘Trinity of Kats’) was already waiting there with a green bean, bacon and brussel sprout dish that was, um, LEGENDARY. The only person missing was Marek, the world’s biggest sweetheart. “These carrots have only been in here for twenty minutes,” I whispered to Katka. Any minute, Mat would be back to carry the turkey over for us and our carrots still weren’t finished. We pulled them out to have a look. The brown sugar had liquidized in the bottom of the pan and the carrots were only just beginning to get soft. “Let’s just leave them in for another ten minutes,” said Katka. I ran a nervous hand through my hair and thought for a moment. How do we fix half-baked carrots that don’t taste like sweet potatoes? “Let’s puree them,” I said. Katka was hesitant but produced a kitchen-grade mechanical wizard and we started hacking away. “What are you doing to the carrots?” asked Mat, coming in for Tom. “Turning them into sweet potatoes,” we answered. We both took a nibble of our orange mush. Katka and Mat shuffled around in the kitchen looking for things and I took our carrots out to the front door. 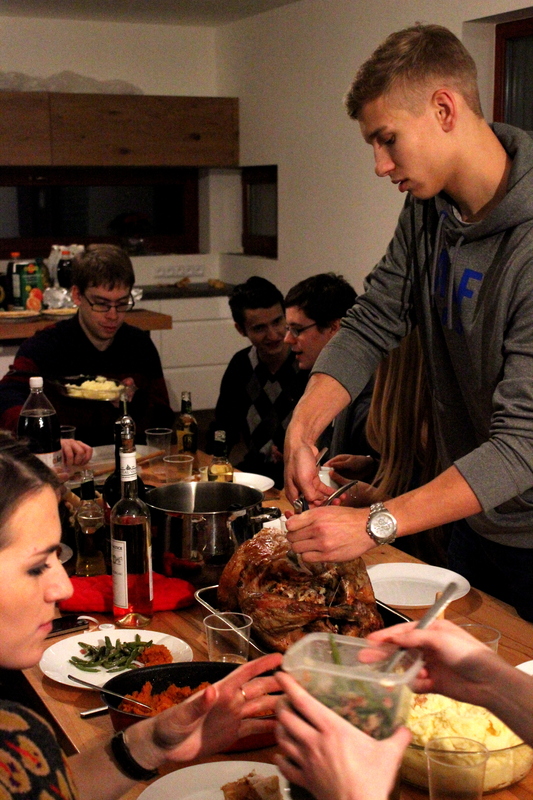 There was Marek, all nicely dressed for a real Thanksgiving dinner. Good friends will always be the sweetest sight for sore eyes. “Do you need help carrying anything,” he asked with is typical genteel grin. “No, we’ve got it all,” I answered, sticking a foot inside my shoe. I laughed at him, trying not to spill the carrots as I balanced on one foot. Princess is not the word I would have used to describe myself in that moment, wearing a food-blotched apron, hair flying off in Einstein directions. We walked across the nippy, dark street into a warm house. The entryway was still partially under construction and there was no furniture or trimmings in the downstairs, but we could hear laughter coming from the dining room. Our guests sat at a long table with the various platters of food spread out between cheap plates and mismatched silverware. Numerous bottles of wine, cider, coca cola and juice popped up around the table or waited in bursts along the countertop. The last minute bustlers settled down around the table and Jared prayed over the meal. And then we all stared at the huge, steaming turkey with stuffing popping out of places it wasn’t supposed to. It was a valid question. With no clear “head of the household” we had no one to dish the turkey. I was sitting in front of it, but one attempt with the “meat scissors” and someone suggested I just sit back and enjoy myself instead. Mat took over and I wandered around taking pictures and making sure everyone tried all the dishes. “These really do taste like sweet potatoes,” said someone, to my relief. There were plenty of mashed potatoes, the stuffing was out-of-this-world (and I don’t even like stuffing normally), and the final drippings from the turkey had done a miracle on my gravy which was now the lovely consistency and proportionate to the number of our guests. And the turkey. The turkey was perfect. We chit-chatted about where people were from and what they were doing in Prague. We talked about food and friends and culture. My end of the table decided to only talk in song lyrics for about twenty minutes. 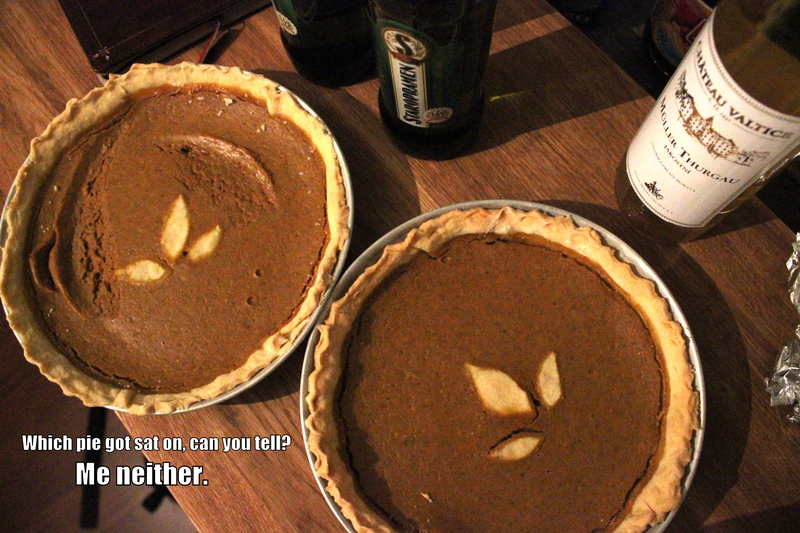 We passed around pumpkin pie and chocolate cheesecake (“So tell me what you want, what you really, really want”). Finally, I stood up, rung my class with a fork (I have ALWAYS wanted to do that), and apologized for interrupting the pleasantness. “This will be the last time, I promise,” I giggled. “Why don’t I believe that?” muttered Nils behind an empty wine glass. I could see everyone’s attentive eyes searching for the point in my monologue. So I cleared my throat and jumped to the heart of my speech. There was a chorus of ‘awww’s and some glasses clicked. Not the greatest Thanksgiving speech of all time, but it was heartfelt and everyone was so far into the turkey-coma stage of the evening that I don’t think anyone minded the brevity. Mat leaned back in his chair and looked at me across the table as conversations sprang up again at either end. “You brought a little piece of America to the Czech Republic,” he said. I smiled. It certainly felt like that. Around eleven o’clock, everyone left to catch buses, trams and metros home. Only Kačka stayed to help us clear dishes – she lives right down the road. “This needs to be opened,” she said, plopping into an empty chair and cuddling a bottle of wine. Katka and I finished stacking plates and joined her. Mat lounged in his seat on the other side of the table and watched us. “There’s a lot of food left,” said Katka. “We’ll eat it,” said Mat. No one moved, but in unison, we sighed happily. “It was your idea,” I reminded her. But I smiled. I had to. I had a lot to be thankful for.